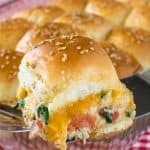 Chicken salad and melted cheese inside a little Pillsbury Crescent Roll cup makes a delicious little appetizer or snack. 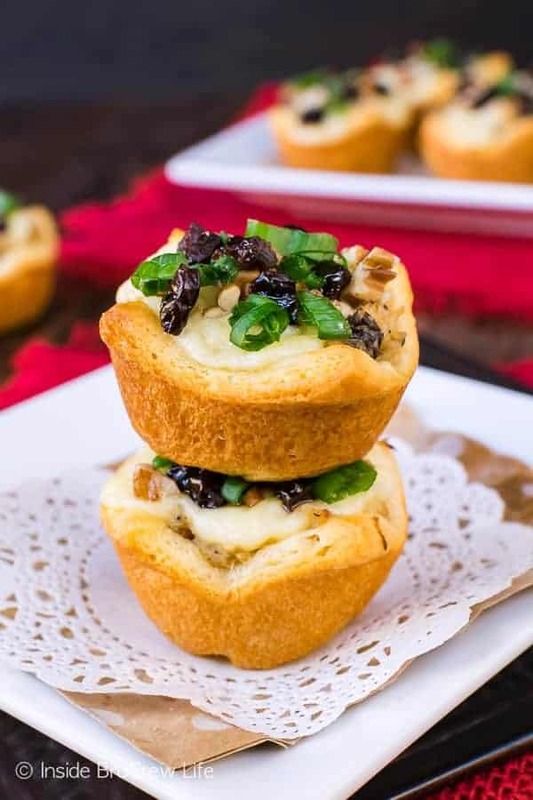 These Sweet and Spicy Chicken Salad Crescent Bites will disappear in a hurry when you bring them to game day parties. *I am partnering with Pillsbury™ this month to bring you this recipe. As always, all opinions are 100% my own. 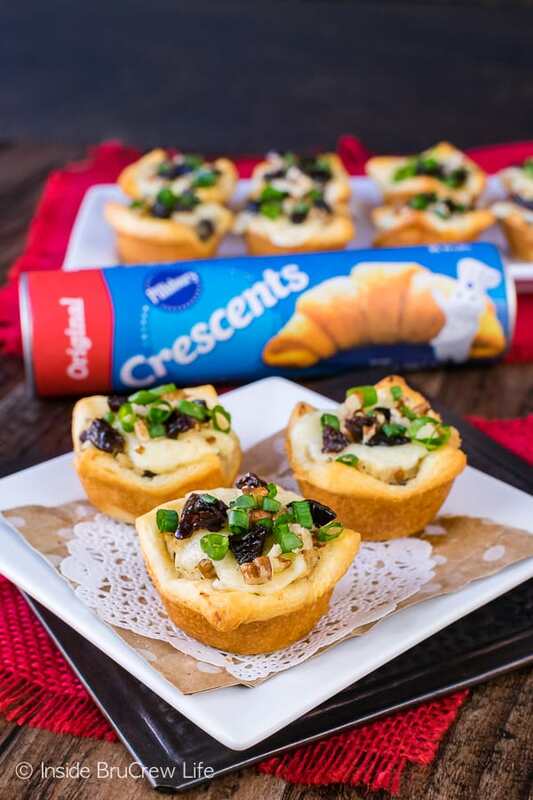 This month I have the awesome opportunity to share a recipe that I created for the Pillsbury Made At Home campaign using crescent rolls. 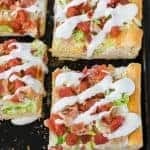 These refrigerated rolls were a staple in our house as I was growing up, and now I keep them in our fridge for easy dinners like this chicken BLT ranch pizza. I jumped at the opportunity to create a fun little appetizer that we could eat while playing games. Little snack cups are no stranger in our house. 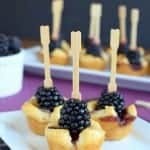 These little tropical meatball crescent cups and these blackberry brie bites are a few of my favorites. 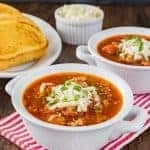 Of course, just making the crescents as directed on the package and filling them with cherry walnut chicken salad is also an easy dinner for busy nights. One of our favorite things to do at night is to shut off all electronics and tv’s and play games as a family. Now obviously this doesn’t happen every single night of the week. 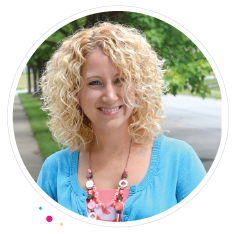 There is homework to do, meetings to attend, chores to finish, sports and activities, and work outs to fit in to our busy schedules. The world around us sees busy as being normal. I know parents that have their children enrolled in classes and activities every night of the week. One thing that my husband and I decided when our children were younger, was that they could only choose one activity at a time. We wanted them to really invest time into that activity to see if it was one they enjoyed. Even with a limited busy schedule, it is easy to push family time aside for other activities. Meetings and calls come up unexpectedly. And then there is social media. It doesn’t sleep. There are days when I look around our house and everyone is on a device. Those are the moments that we call for a time out. Having that family time to connect and interact is so important in our growing children’s lives. We want them to remember our family laughing around a table as we played games and ate snacks for dinner. The past few months this has become even more important to me. I think part of that passion in me comes because our oldest son headed off to college last fall. It made me realize how quickly the time with our children passes by. So many people warned me that our kids would grow up in the blink of an eye. It’s just hard on a mama when you are at this stage looking back. It makes me so thankful that I was able to be a stay-at-home mom and invest time each day when they were little. Now that they are older, I want to make sure to continue investing time into their lives. I know if I blink, the other two will be headed off to college soon too. Honestly, that thought makes me tear up and get all weepy. 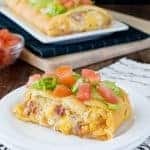 But instead of breaking down and wishing time would stand still, I get into the kitchen and create some fun little appetizers that we can eat during our game nights. These fun family times are good for a mama’s heart. 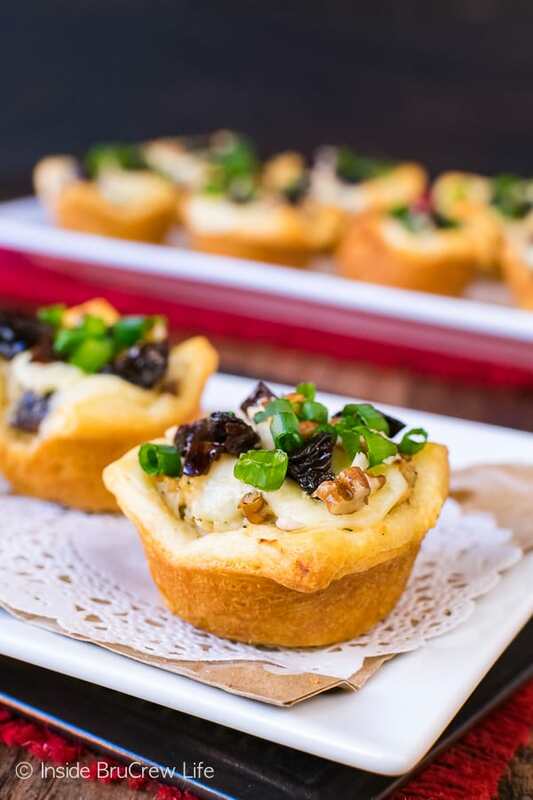 I decided to combine a few of our favorite recipes, and these little sweet and spicy chicken salad crescent bites were born. 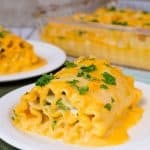 The best part about this recipe is how versatile it is. You can make the cups like I did, or you could roll the chicken salad up inside the rolls, cut spirals, and bake. Or just make crescent rolls and eat the chicken salad. All three methods work and taste amazing. Open and drain the chicken. Make sure to really get that extra liquid out. You do not want soggy chicken salad in your crescent cups. Mix together the mustard, mayo, and dill. Pour this over the chicken, pecans, and chopped dried cherries. Season your mixture to taste with salt and pepper. Refrigerate until needed. Cut a 4-ounce block of cheese into 24 mini cubes. I used Havarti, but mozzarella or provolone would be good too. Open the crescent rolls and press together the triangles to create four rectangles. Cut each of these into 6 even squares. Press the crescent squares into 2 greased mini muffin tins. 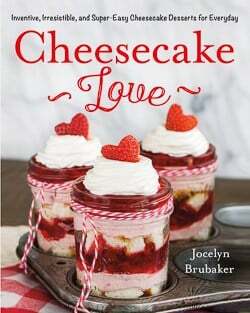 Fill each cup full with chicken salad and press a cheese cube on top. Bake for 12 minutes. 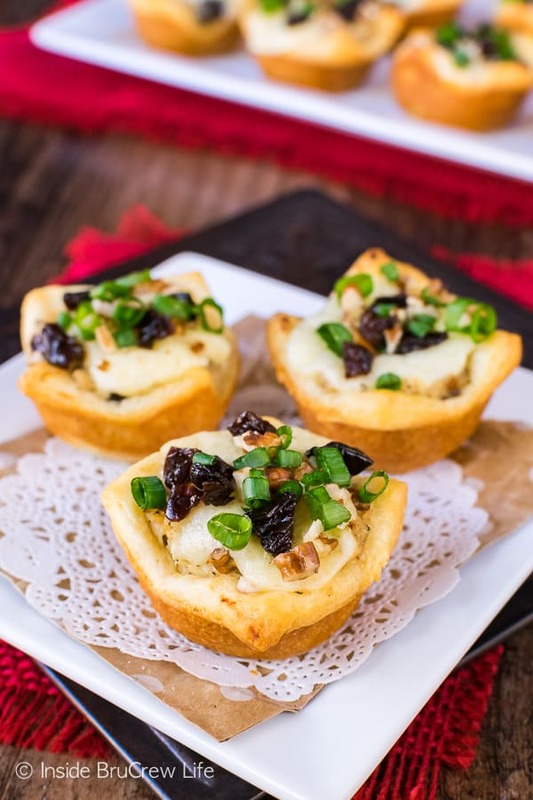 Remove and garnish immediately with more pecans, cherries, and green onions. Serve to your family and watch the crescent cups disappear in a flash. You should probably double the recipe. Chicken salad and melted cheese inside a little Pillsbury Crescent Roll cup makes a delicious little appetizer. 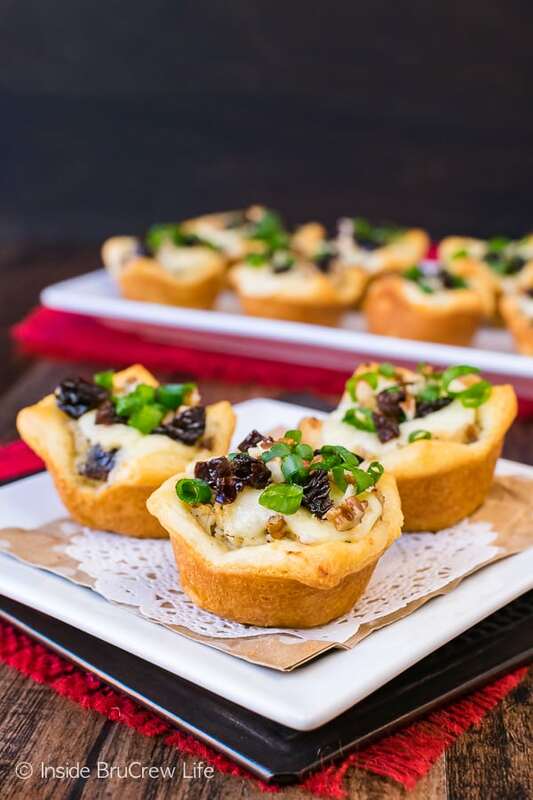 These Sweet and Spicy Chicken Salad Crescent Bites will disappear in a hurry when you bring them to game day parties. Preheat the oven to 375 degrees. Spray 2 - 12 count mini muffin tins with nonstick spray. Whisk together the mustard, mayo, dill, and garlic powder. Stir together the chicken, 1/2 cup cherries, 1/4 cup pecans, and yellow onions. Pour the mustard mixture on top and stir together. Season to taste with salt and pepper. Refrigerate. Cut the block of cheese into 24 mini cubes. Open the crescent rolls and unroll them. Press the triangles together to create four rectangles. Cut each rectangle into 6 even squares. Press the squares into the prepared pans. Fill each cup almost full with chicken salad. Place a cheese cube on top. Bake for 12 minutes. Remove and top immediately with the extra cherries, pecans, and green onions. Gently lift the cups out of the pan and serve while warm.